Mound 72 Points Made Of Black Chert. This arrow point was found during the excavation of mound 72 in one of three caches that together contained approximately 1200 stone projectile points. Two groups were hafted on arrow shafts and the other group was placed within some type of fragile container that did not survive. Mound 72 contained several different styles of projectile points. The majority of them represent point types familiar to the Cahokia area. But several other examples are "exotic" forms that originate from as far away as Arkansas and Oklahoma. 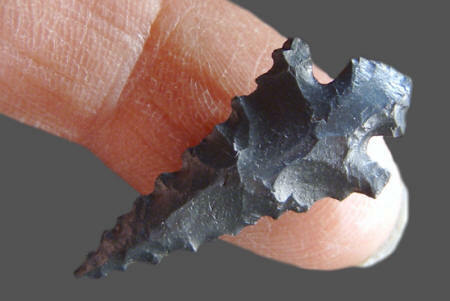 The mound 72 point offered here, as a cast, was found within a group of 106 other examples. They were discovered within a much larger cache. All the points in this cache were laid out in a straight line suggesting they were once hafted onto arrow shafts. The style of these points vary somewhere between Agee and Hayes points. Most of these point types originate from Arkansas and Oklahoma. All of the points in this group are corner-notched and serrated. The bases vary from straight to rounded and diamond shape. This point is serrated, corner-notched and the base has been nicely pressure flaked into a diamond shaped. All of the 107 points in this group are made of a dark black or blue-black chert. This point measures 1 3/8 inches (3.4 cm) long.